Dubber and Clutch: Postcard: bikes FTW! 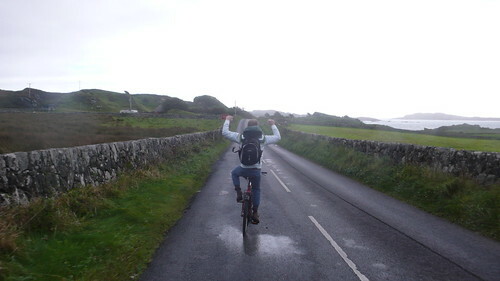 We rented bikes on Islay and this has been our main mode of transport in fair weather and torrential downpour. We did a good, leisurely 7 or 8 miles yesterday just to get the hang of it again after all these years. Within that range from Port Ellen (where we’re staying) lie Laphroaig, Lagavulin and Ardbeg distilleries. Today, we might go for a 12 mile ride and get as far as Bowmore. But first – we have a large breakfast and a morning guided tour at Lagavulin (in the opposite direction) all planned. This is EXACTLY the kind of trip I need to rid myself of my whisky (no e) ignorance! You will tell me how it went, won’t you? Careful on those bikes!